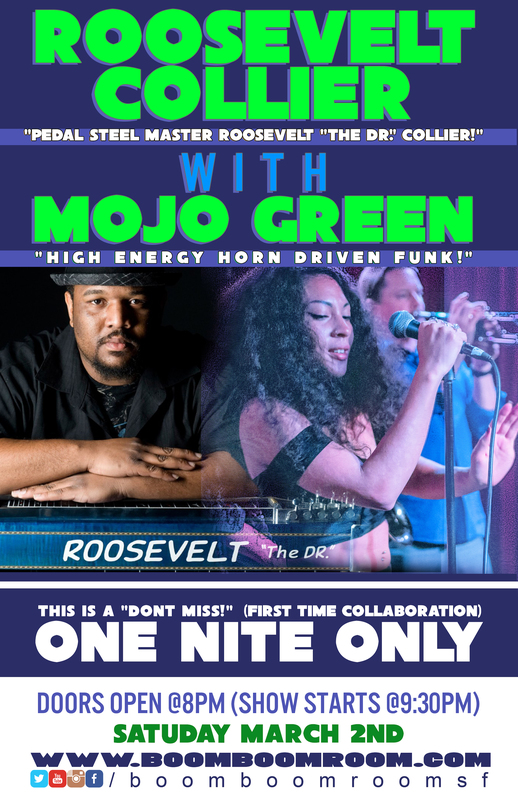 ROOSEVELT COLLIER is now joining this bill with MOJO GREEN for a rare and exceptional “first time ever” collaboration as these powerhouse musicians perform the whole night together as one band. …has recently supported Lyrics Born, Karl Denson‘s Tiny Universe, Lettuce, The Funky Meters, The Motet, Trombone Shorty, Orgone, The Pimps Of Joytime, Dumpstaphunk, Galactic, The New Mastersounds, Big Sam’s Funky Nation, ALO, Turkuaz, The Monophonics, Rusted Root and has earned them the reputation of being one of the funkiest high energy live shows on the West Coast. In the pantheon of bands who have chiseledtheir name in BooM BooM RooM show greats, this one is at the top of the list. Sacredpedal steel guitarist/vocalist Roosevelt Collier is one of the most highlyrespected musicians on the scene today. He has shared the stage with a who’swho of greats including The Meters, Allman Brothers Band, Tedeschi Trucks Band,Government Mule, Widespread Panic, Karl Denson, String Cheese Incident,Umphrey’s McGee and many more.